My colleague, make-up artist Tirzah, in combat trim. She can fight with pistol, knife or bare hands…but using a pistol is easier on the fingernails. 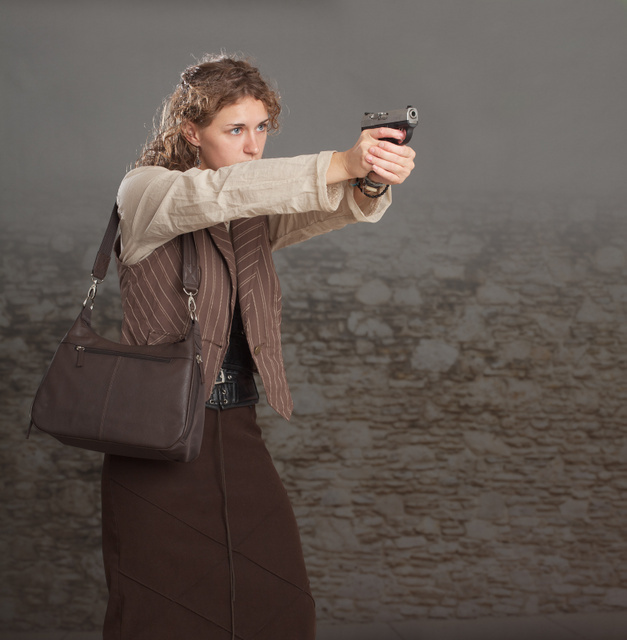 The holster purse is from Gun Tote’n Mamas. This entry was posted in holster, interesting people, pistol, self-defense and tagged 9x19, boberg, brown, girl, pretty, XR9-S. Bookmark the permalink. Remarkable picture, stunning eye’s, hair and pose. Generally I find most of your pictures of female model’s with gun’s a bit off kilter this one hits the mark. Kudos to you and your subject! Conversely, I find the vast majority of your work “hits the mark” remarkably well. But the first thing I noticed is she appears to be aiming uphill. So either she’s small and aiming at a conventional target or possibly recovering from a recoil. Does the XR9-S have lot of barrel rise? Not much muzzle rise. She’s short and so aiming a little up — and the camera angle contributes to that. Being plagued with a curiosity for backgrounds of names I looked up this one. Whether chosen or given it is fitting to her. I’ve heard that ‘Mexican carry’ originated dirung the disarmament of the Mexican citizenry, since being caught with a holster would be treated the same as having a gun, they stopped using holsters in case they needed to ditch the gun to avoid being caught with it. The same idea would appeal to criminals the same as with (otherwise) law-abiding citizens. Although considering how lightly gun carrying felons are punished (usually not even being charged if no other crime was committed) it’s hard to see why they don’t just use holsters anyway.